Harvard Arab Weekend (HAW), an annual pan-Arab conference organized by the Harvard Arab Weekend Committee and Harvard Arab Alumni Association, will be held at the Harvard University campus on November 10-13, 2016. 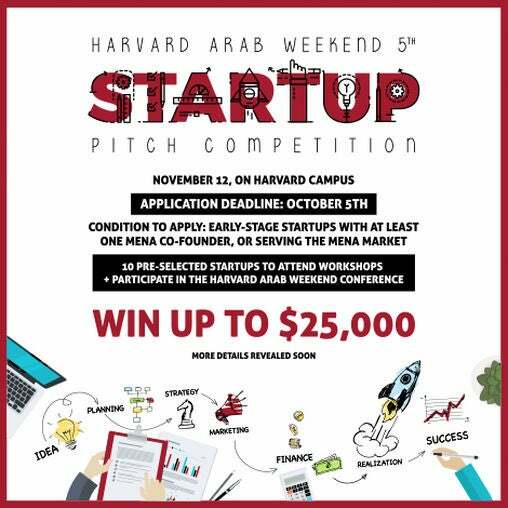 The event provides a platform for MENA startups to showcase their business to a global audience as HAW 2016 hosts the fifth edition of the Harvard Arab Weekend Startup Pitch competition, organized by the Harvard Business School MENA club and the Harvard Arab Alumni Association. Ten pre-selected early-stage startups will get a chance to pitch at the challenge, and compete for monetary prizes up to US$25,000. Startups that have at least one co-founder from MENA, or address the MENA market will be considered eligible and need to apply before October 8, 2016. In its tenth edition, HAW 2016 is themed "Beyond the present; striving towards a brighter future," and being at its decade mark, its focus is on the Arab world’s future, key challenges that lie ahead, and the catalysts required to make a difference. Divided into six segments on the basis of six themes: arts, healthcare, activism, identity, migration, and development, the event brings together individuals to engage with one another in various forms including panel discussions, keynote speeches, workshops, and networking events. Running across the three days, the workshops and talks cover topics such as building startups in MENA, role of venture capital and private equity in the region, diversifying the economy away from oil, and others. The role of innovation in tackling the refugee crisis also figures as a key theme on the event’s agenda. In line with its objective to empower the youth, the event also features a career fair to connect job seekers to potential employers. Speakers sharing insights at the event include Dr. Dalya Al Muthanna, president and CEO, General Electric Gulf, Tirad Al-Mahmoud, Group CEO, Abu Dhabi Islamic Bank (ADIB), H.E. Hussain Al Nowais, Chairman, Al Nowais Investments, and others.